I had it on my calendar to make today my announcement of my A to Z theme. Naturally, having written that down, I proceeded to not think of a theme. I have some ideas glimmering around the edge of my mind. I might focus on a character from a favorite book (surely I can find on for every letter of the alphabet--I have a lot of favorite books!). I'd like to do more with photos, but I already did the outdoor adventure theme last year, so that's out. A story every day for the month would be cool, but might be tough to pull off. I might even like to generate a random word for each letter of the alphabet, and create something--story, photo essay, book review--around that letter. If I do any of those things--or come up with something else totally brilliant--you'll know when A to Z starts! And if you want to steal any of those ideas, help yourself. Even if I end up doing the same one, the beauty of the human mind is that we would end up doing totally different things! 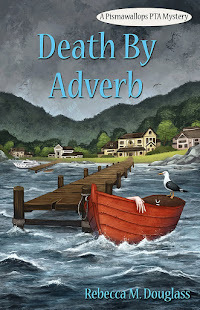 In other business: work continues on the edits for Death By Trombone, book 2 in the Pismawallops PTA murder series. Progress on the 3rd Ninja Librarian book has been less visible. Other ideas are percolating--I hope they don't shove Skunk Corners aside, because I know a lot of people want to see what happens next there! I have also committed once again to ride the Chico Wildflower Century at the end of April. That means I'm back to serious training on my bike. And that gives me what I think I'll throw in for my gratuitous photos--shots of some of the places we rode during our training last year, and will be riding again before we're done. 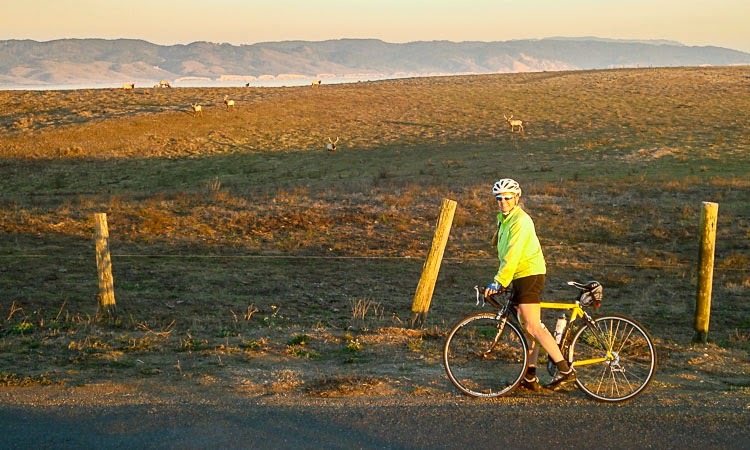 I am very fortunate to live in a place with an excess of beautiful places to ride, and plenty of hills to train on (yes, that is a positive thing--at least if I insist on riding centuries with 5 or 6 thousand feet of climbing!). Since I let the spouse handle the camera on these rides, the photos are his, not mine (copyright info embedded). 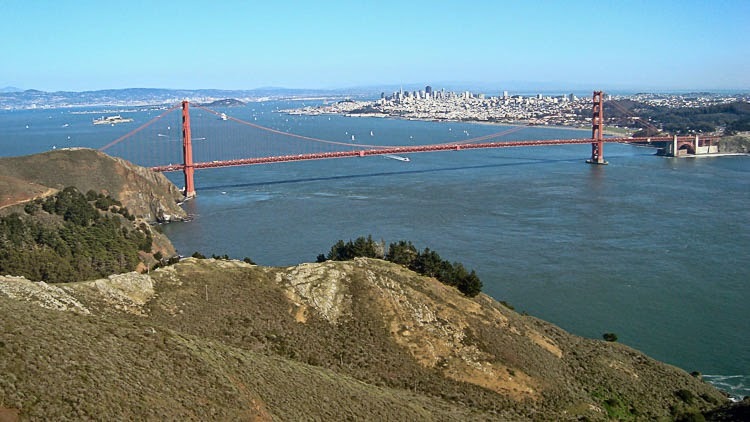 Golden Gate Bridge and San Francisco from the Marin Headlands. On a perfect day--they don't all look like this! Me and the tule elk at Pt. Reyes National Seashore. The sun was setting, and we had miles to go--we finished that ride in the dark for sure, and it was cold! Me with the beacon atop Mt. 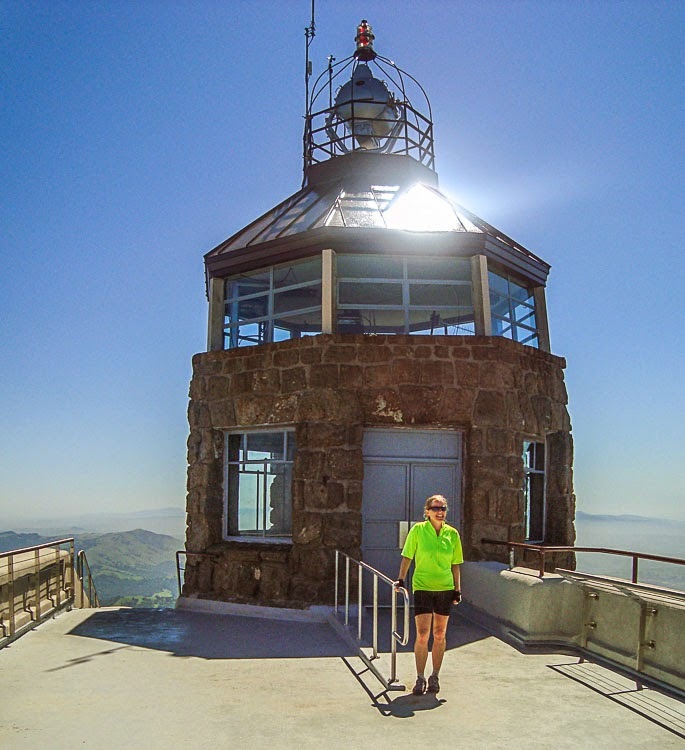 Diablo (3849'), in the East Bay. This beacon is maybe 30 miles inland, but high enough that it could be seen 100 miles out at sea, though it was meant for aviation. Built in 1928, it was shut down during WWII and since has been lit only once a year, to commemorate the bombing of Pearl Harbor. 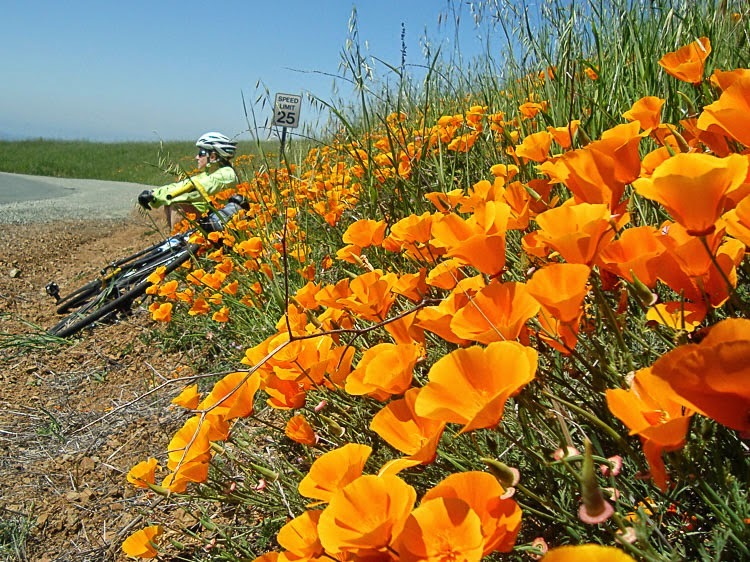 Biking among the California Poppies can be pretty breath-taking. Going north instead of east takes us into the redwood groves on Mt. Tamalpais. And the big day--a typical rest-stop scene at the Wildflower Century. Well, typical except for the rain. Last year it rained, and instead of losing riders to heat exhaustion, they were in danger of losing some (me included) to hypothermia. The previous year, I had to stop a pour ice water over my head. Last year, I had to eat lunch in a super-heated room and still couldn't get warm! The real appeal of a ride like this is the food. 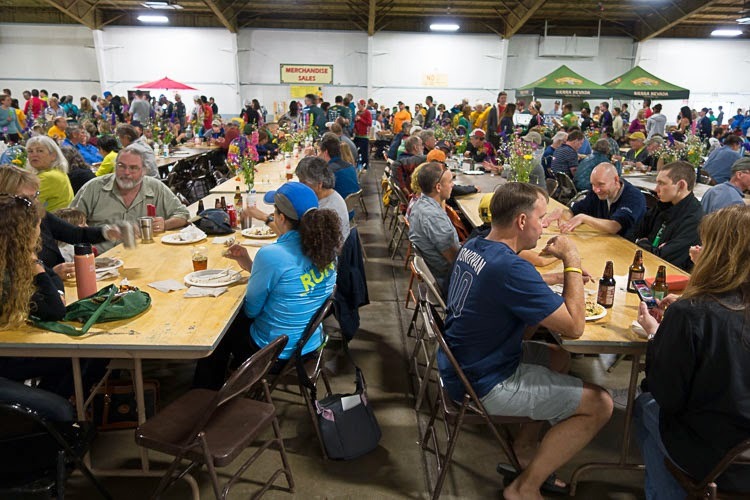 Not only do you get to stuff yourself at 4 rest stops plus lunch, but when you finish the ride, there's a dinner at the fairgrounds. 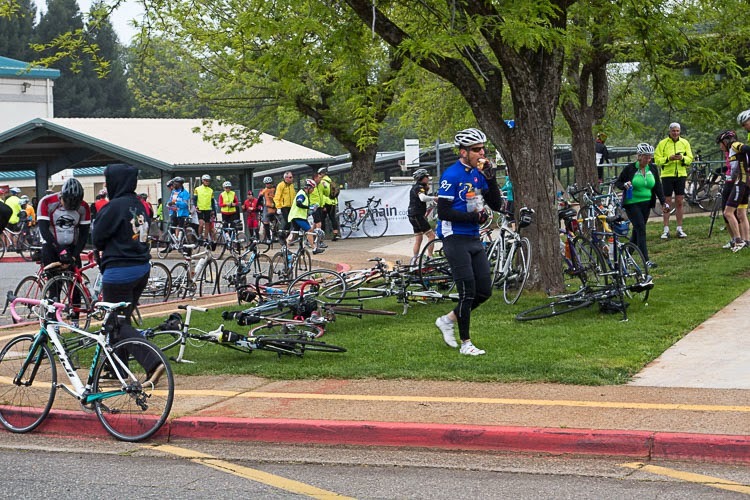 With about 6 different ride-lengths, the event draws 4000 riders of all ages and abilities. 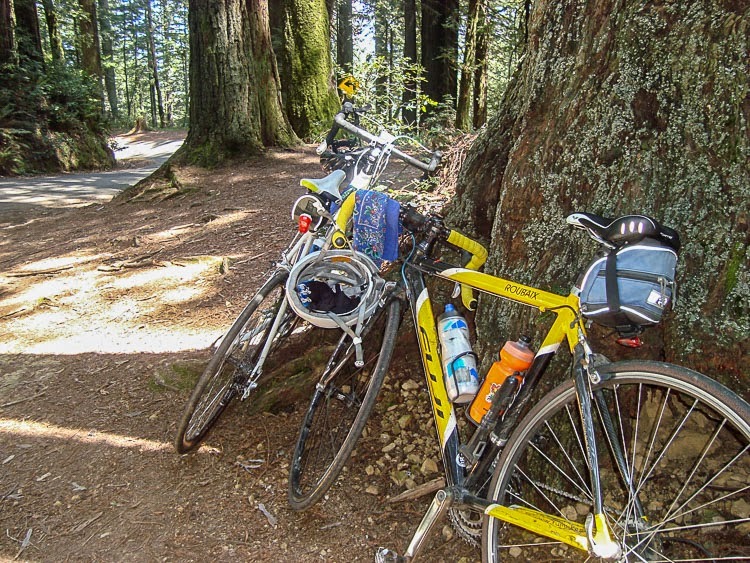 Just in case you live in northern California and this looks like your kind of insanity, I'm going to toss in a link to the Chico Velo Web page where you can sign up! Waiting for the pirates to come, I suspect. See you on Wednesday, for a book review! Arg! Frustrated by the sizing issues with the photos. Seems like I can only keep them within the viewing window by making them pretty small. Off to experiment. You could try increasing the writing area of your blog by up to half an inch. It leaves less for your sidebar but, apart from the fantastic Local Heroes Badge (which you could resize), I think it could take it. I could...if I could see how. I'm using a set template, and I'm not sure Blogger lets us mess with that. What really bugs me is that when I'm composing, the pictures fit. You'd think it would warn me or resize automatically, but no. 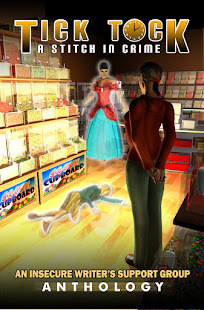 I did manage to do it on my Princelings Publications blogger site - for much the same reason. I have a feeling you have to go back to the template to adjust the width of the columns. Yes, you do, I've just checked :) It shows you your current layout and you can customise it. It also shows you the mobile set up too, which I didnt know! I did look at the template, but didn't see the option. I'll go look closer. I'm also contemplating changing to a simpler and cleaner template, without the background photo. What do you think? Oh, geez. I just found it, and the little slide bar. Took about 2 seconds. I am so dim! I never noticed the "customize" link--even though I see by the notes that I DID customize it when I first set this up! Death by Trombone - great title. Great post! You can always wait till the Team leaders have the Theme Reveal event sometime in March. The more importnant part is that it's only 62 days or so till April... not much time to get those posts scheduled! That's why I want to pick the theme now! Especially if I go with one that involves a lot of writing, I need to get an early start. I'll probably pick one choice and go with it, then do the official reveal in March. I REALLY have to have it together this year, because I expect to be on the road for a week at the beginning of the month (our last family spring break trip before Eldest Son goes off to university!). Okay, so now I have to hate you :D I really do want to get a better start on it than last year, though I did much better on that one than I did the year before! They are pretty smart kids :) Well, almost not kids anymore. 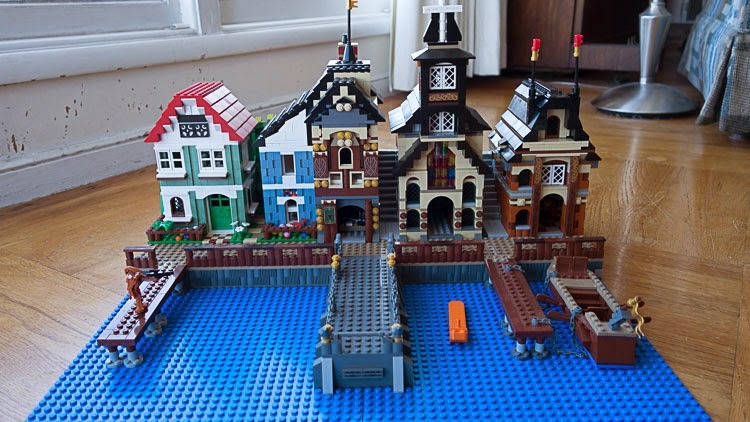 I don't know if we'll get any more amazing Lego creations :( Though I keep telling them to keep working at it; maybe they could get work as designers for Lego! Thanks! I'm fiddling with the format. For a while it was just reviews and fiction, but I'm feeling like sharing my trips and photos for a while. Hope I don't disappoint in April! Yeah, that's why it's tempting. But I don't yet have a hook that would work for me. I actually kind of like the random word thing--it would give me direction, but be wide open to interpretation! But characters from favorite books...that would be more in keeping with my usual blogging, but still pretty wide open...decisions, decisions! Photo Monday: Take the Kids Hiking!